We were a bit surprised when our son-in-law, Gareth, made this suggestion at 11 am one chilly morning in November. ‘That’s a long way to go for lunch!’, we exclaimed. ‘It’s only a one hour drive away, plenty of time!’, said Gareth. Now this is a classic example of being ‘accidentally cultured’! From where we live in Sydney, a one hour drive from home leads you to places of dubious cultural heritage like Wollongong, Gosford, or Penrith. But, I am glowing with pleasure because I have been researching the Via Francigena. It is an ancient medieval pilgrim route starting at Canterbury Cathedral in England and ending at St Peter’s Basilica in Rome. 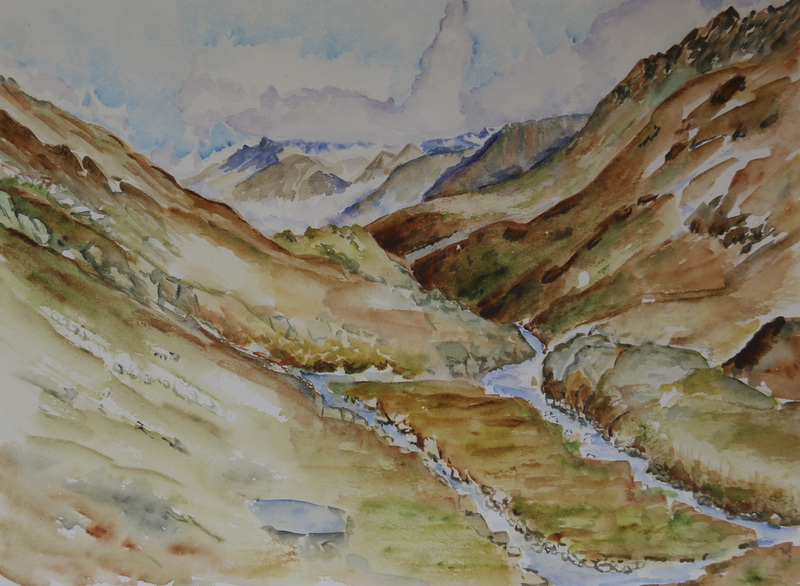 And, Grand-St.-Bernard Pass, high in the Swiss Alps at the border between Switzerland and Italy, is at the heart of the pilgrim route. I just can’t wait to see it! It is early November and no snow has fallen yet. So, as we head up into the Swiss Alps the views are totally ‘sublime’! To put it mildly, it is a geologist’s paradise! 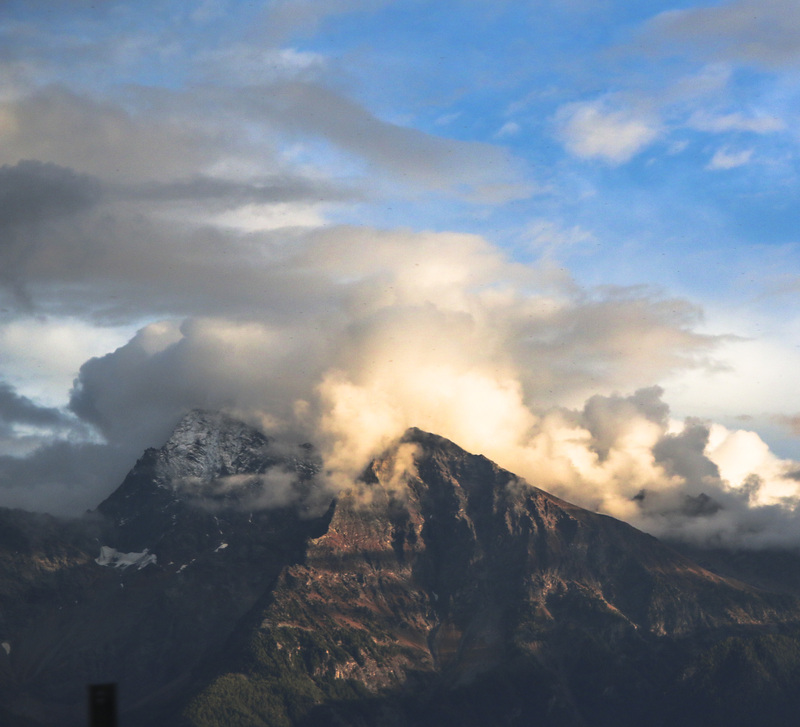 The rocky landscape tells its alpine tale of geological upheavals with a multitude of golden and earth brown rocks of every shape and size imaginable. The landscape is interlaced with alpine streams, tufts of foliage and tiny flowers. But, within days of our visit, this harsh terrain will be metres deep in snow. 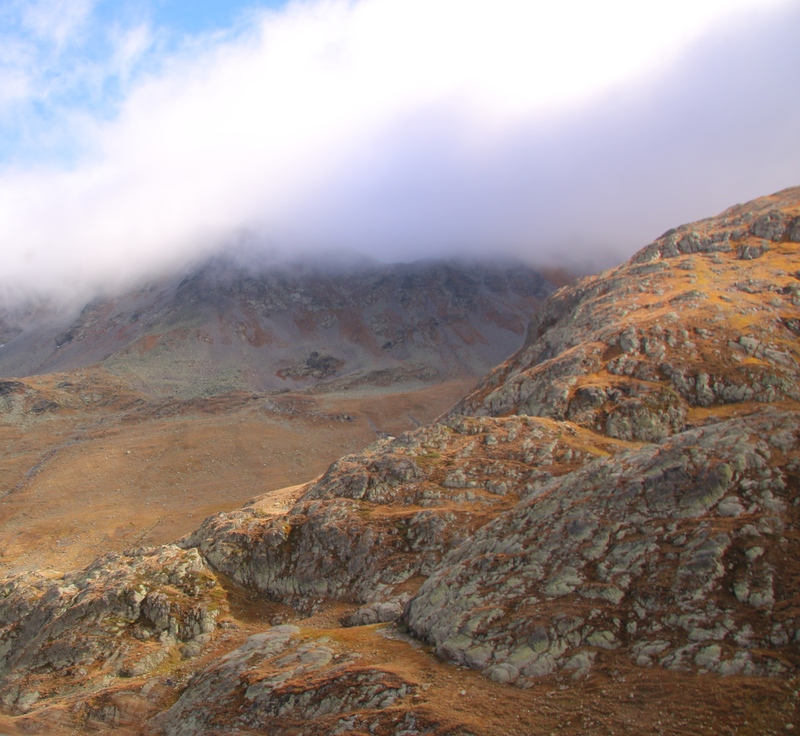 The ‘other worldly’ nature of this terrain transports me into its long and varied history. Approaching the summit, I have a vision of Hannibal crossing the Alps with his elephants. I am filled with wonder by what has occurred here over the ages from primitive man, to the Romans, the pilgrims, Napoléan and his army, and now us! This area has inspired a wealth of artworks. In fact, the road into Aosta was used by Turner to paint Snow Storm: Hannibal and his Army Crossing the Alps, in 1812. In Martigny, I found an exhibition catalogue with many artworks from this area. I love painting the ‘sublime‘! So here is my humble effort to walk in Turner’s footsteps! After a 30 minute drive we arrive at Grand-St-Bernard Pass at an altitude of 2473 m (8114 ft). So, we stop to visit the St Bernard Hospice which was established in the 12th century to offer travellers shelter from blizzards. I am extremely excited because I am about to arrive at the heart of the Via Francigena. Here, the monks bred the famous St Bernard dogs who could find travellers lost in the snow and guide them to shelter. The dogs are often depicted with a barrel of brandy around their necks to warm those being rescued. 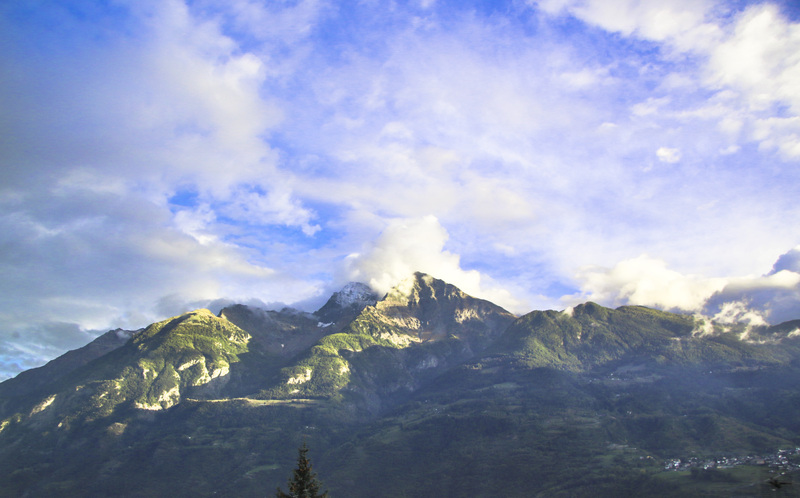 But, the dogs have been taken to Martigny for the winter. So, we can’t see them in their alpine environment. Then, we make a hasty tour of the Chapel and Museum in the Hospice. 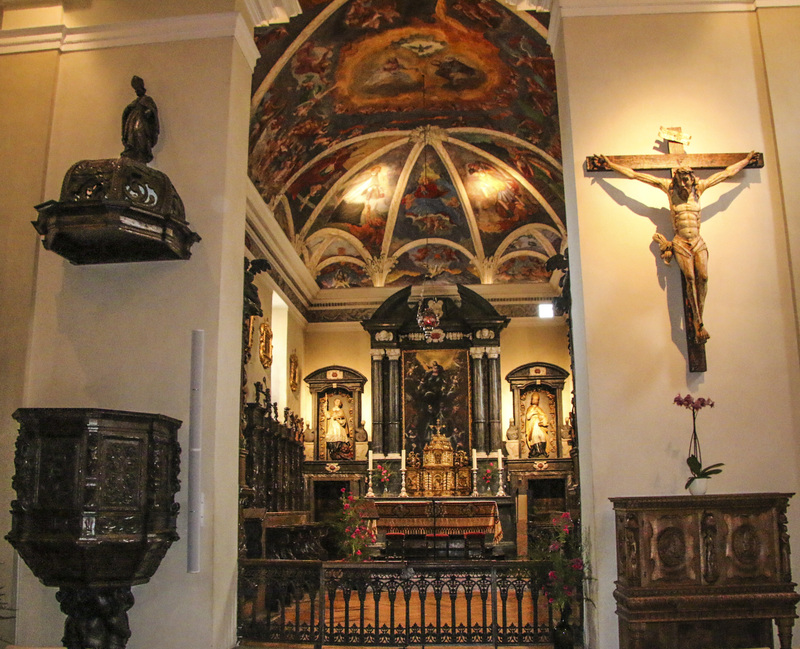 This image of the main altar gives a glimpse of the magnificent art works in the Chapel. 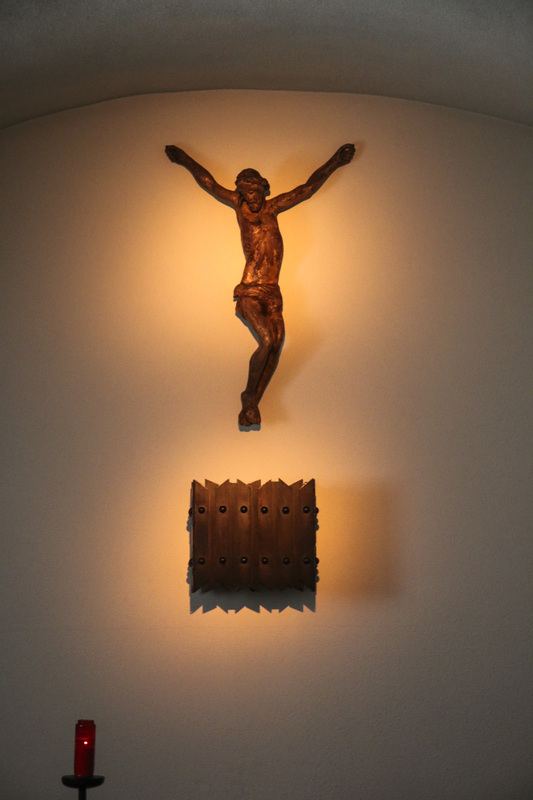 There is a more contemporary chapel beneath the main one with this crucifix the central focus. Here, we sit for a while absorbing the peaceful feeling of this magic alpine place. Then, our tummies remind us that we have to leave the hospice and resume our journey to Aosta for lunch! One of my biggest disappointments about living in Australia has always been no borders to cross to visit another country. This has left me with a fascination for borders. So I especially love this border leading into Italy. Not only is the scenery stunning, but in the photograph you can see sections of an ancient Roman road! 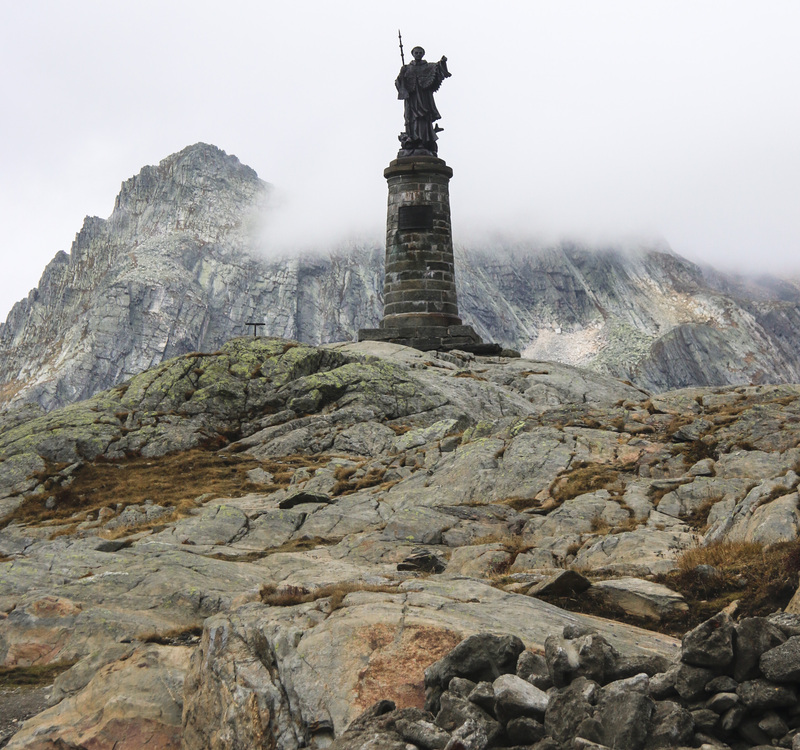 So we say goodbye to St Bernard standing guard over the Pass and head down into the Aosta Valley. Descending into the Aosta Valley the views of the Rhône Alps and villages scattered throughout the valley are stunning! We arrive in Aosta so late we nearly miss out on lunch altogether. But, I don’t mind because walking around looking for a restaurant, I get to see all the ancient Roman ruins. I am fascinated by the way the ancient ruins and modern dwellings co-exist. I love ‘old towns’! And I rapidly discover that the cobble stone main street is lined with very interesting shops. But, we have to settle for window shopping because the shops are closed for siesta! 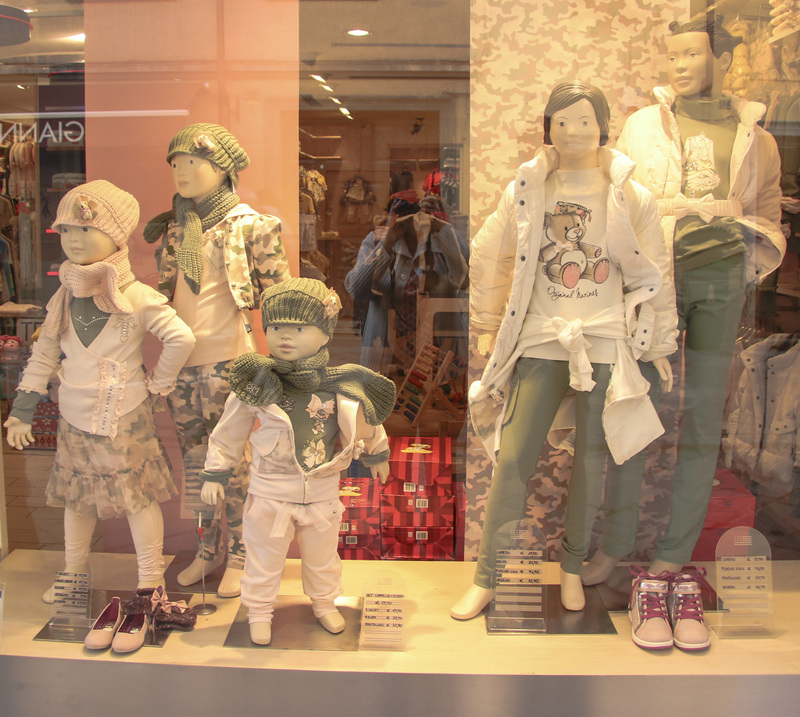 And, here is a taste of some northern Italian winter fashions! My favourite food shop has an delightful range of macarons! And yes, this is not a tool shop! These are actually chocolates! 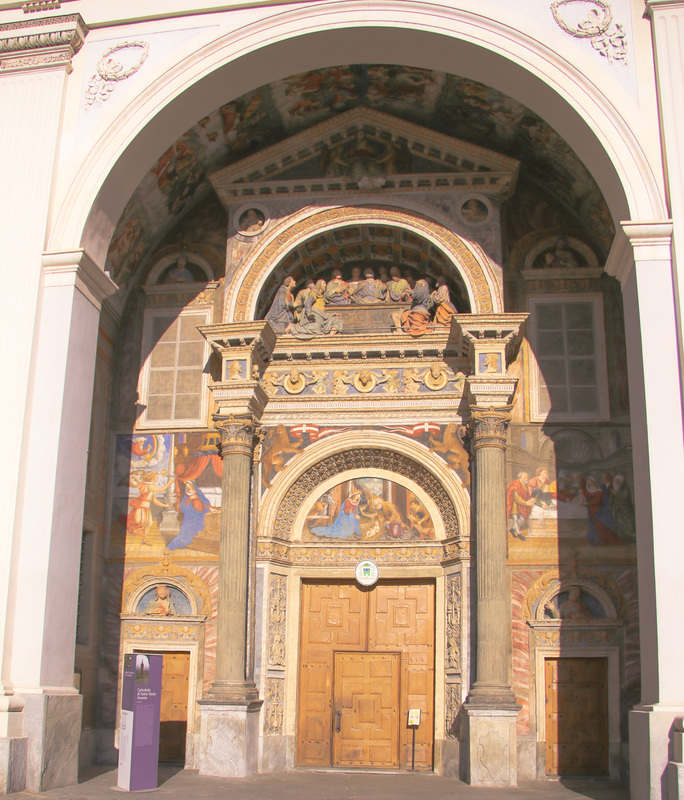 The Cathedral in Aosta is another famous Via Francigena pilgrim destination. And, I am delighted to see the western portal still glowing with its original colours. But, it too, was closed for siesta. Eventually, we end up so late for lunch all the restaurants are closed. So we have to settle for this pizza café. However, the large pizza, salad, and glass of wine cheer us up! There is, however, a downside to this cafe. It has a squat toilet! And, although AC doesn’t mind using it, the rest of the afternoon is taken up looking for a clean toilet. Unexpectedly, we find an ice cream shop with an ancient altar piece for its counter. And, its ice cream is only rivalled by its lovely clean, modern rest room! Finally, we end our visit to Aosta by buying a heap of tantalising regional cooking ingredients. Then we head back to Le Châble to cook our dinner. And, on our way home the spectacular scenery glows in the evening light. Although our lunch was somewhat ordinary, this turned out to be an extraordinary ‘cultural experience’! I would love to hear whether you enjoyed this story. Your email address will not be published. Oh, how I miss the challenge, ‘which country should we drive to for lunch today?’ An amazing, uplifting, day, ‘so much to do, so little time’, except for lunch! 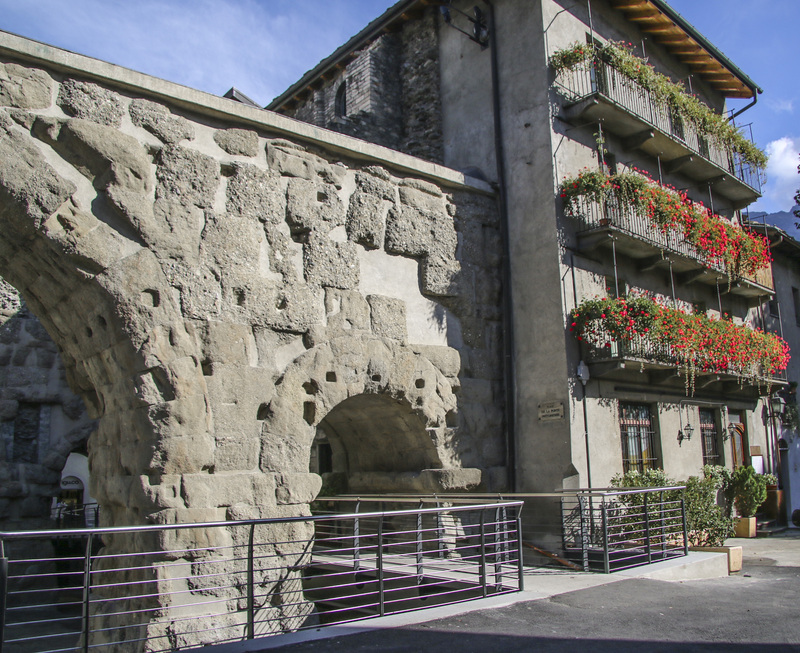 We stayed overnight in a small inn at Aosta and droveup to the Pass and Hospitz. It was my birthday and I asked a monk if I could play the organ in the chapel. To my delightful surprise he said yes and handed me the keys to the organ loft and left me to improvise music for almost an hour. What a memorable birthday!